Full Color Scanning With Duplex Capabilities. The Ricoh Aficio IS330DC Color Imaging Scanner delivers high-quality, full-color digital images for those users working with demanding, color applications. With its intelligent design and the latest in high-speed color scanning capabilities, the IS330DC will effortlessly distribute all your documents electronically. Rated as the fastest color scanner in its class, this innovative product can greatly increase productivity while seamlessly connecting to your existing network. Whether it is scanning color images for a Desktop Publishing project, or easily handling the B/W production requirements of Document Management applications, Ricoh's IS330DC scanner is never idle! With its optional network interface card (400674 NIC), the IS330DC can be shared by numerous users in a workgroup to achieve a digital "paperless" office solution. The length and width of the original are automatically detected and reflected on the PC screen. 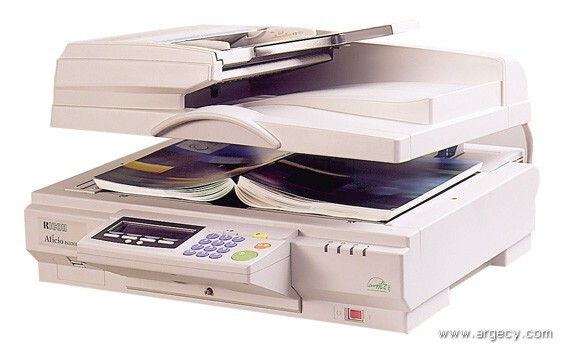 Ricoh is the first to offer this function for both the ADF and Book Mode Scanning. The built-in 50-page ADF delivers unattended input productivity while uniquely providing duplex scanning. Paper is fed and turned through the ADF for scanning of two-sided originals. The IS330DC comes with SCSI-2 and SCSI-3 interface along with ISIS and TWAIN compliant software drivers. With simplex scanning speeds of 26 ppm in full-color and monochrome scan speeds of 38 ppm, this scanner rates "Best in Class". With true 600-dpi optical resolution and color depth of 36-bit input,this scanner guarantees crisp and clean images. Maximum output resolutions of 2400 dpi assure superior results. The IS330DC scanner reliably handles a wide range of paper sizes, from small documents like index cards to 11" x 17" ledger paper. For scanning of delicate originals on the flatbed or multiple documents through the ADF, a convenient start key on the unit can be utilized. Ricoh's TWAIN and ISIS drivers are easy to use and configure to any TWAIN-enabled or ISIS-certified imaging application. Both drivers operate under Windows 95, 98, 2000, ME and NT 4.0. A 20-character x 4-line Operations Panel is available for logical, easy-to-follow instructions and prompts when the scanner is connected to network environments. The IS330DC Image Scanner intelligently integrated paper feeding and other operations for maximum flexibility, enabling convenient placement against a wall. All cables, cords and connectors are recessed so the ADF can be opened without having to relocate the scanner. DOCUMENT SIZE- up to 11" x 17"
DIMENSIONS - 23.2"w x 10.4"h x 21.5"d WT.- 61.7 lbs.